We are leading manufacturer and supplier of Reception Back LED Lights Letters. Our offered products are Corporate Signboard, Advertising Signs and Outdoor Signs. 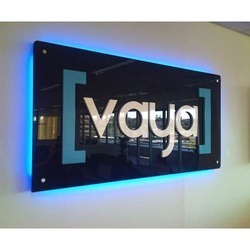 We are a remarkable entity, engaged in offering the finest quality array of Reception Back LED Lights Letters that can withstand adverse conditions and does not need extra care. These offered letters are created from high grade material and advanced tools in accordance with the defined industry norms. We offer this letter in different of sizes and designs for our clients to choose from. Looking for Reception Back LED Lights Letters ?